Fuentes enters his first season with the Ducks and 11th in professional baseball. The outfielder played one season apiece in the Majors with the San Diego Padres (2013), Kansas City Royals (2016) and Arizona Diamondbacks (2017). In 100 MLB games, he totaled three home runs, 15 RBIs, 25 runs, 50 hits, two doubles, two triples and seven stolen bases. His first big league home run was a game-winning solo blast in the 10th inning of a 5-4 win over the Philadelphia Phillies on June 18, 2017. Defensively, Fuentes committed just four errors in 82 games played, spending time at all three outfield spots. 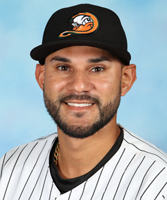 The Orlando native, who played high school baseball in Puerto Rico, spent the 2018 season with Triple-A Reno in the Diamondbacks organization. He batted .265 with six homers, 39 RBIs, 46 runs, 11 doubles, five triples and 10 stolen bases in 85 games. Fuentes was previously selected to play in two MLB Futures Games, representing the World Team in 2011 and 2013. He also represented Puerto Rico at the 2017 World Baseball Classic, finishing in second place. Among the awards he’s garnered, the 28-year-old earned a pair of MiLB.com Organization All-Star selections in the Padres organization (2011, 2013) and was named both a Topps Double-A All-Star and a Texas League Post-Season All-Star in 2013 with the Texas Rangers organization. Fuentes was originally selected in the first round (28th overall) by the Boston Red Sox in the 2009 amateur draft.